This year HSVMA continued its tradition of funding World Spay Day clinics across the country. We supported five veterinary schools which held a clinic either at their school or at a collaborating institution. The veterinary and veterinary technician students who volunteer in these clinics receive invaluable experience in spay and neuter techniques, tissue handing, and the basics of running a high-quality, high- volume clinic. 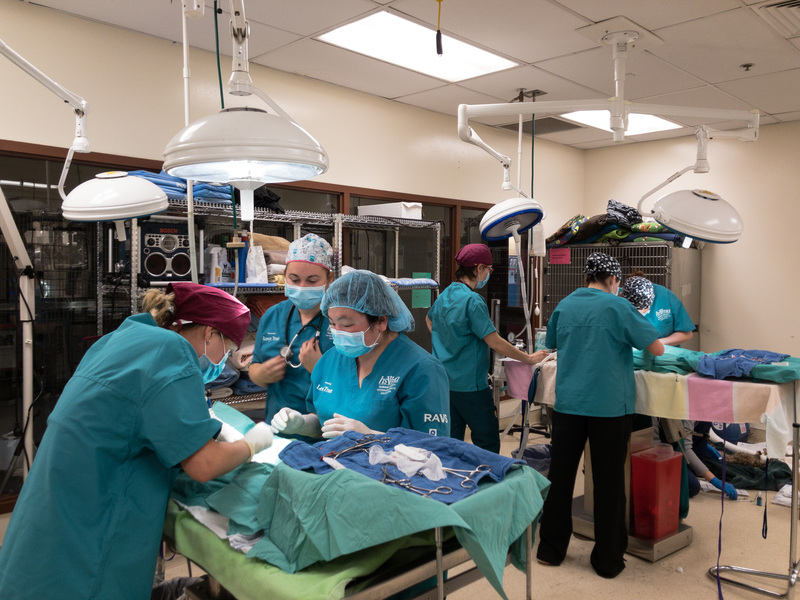 This is often the first time these students see such an endeavor, and, for many, it inspires them to pursue a similar path in their veterinary career. As overpopulation continues to be a hardship at many shelters, and access to veterinary care is a growing problem in some communities, the opportunity to teach students and help animals is a win-win situation. University of Wisconsin, Madison, vet students and Madison College veterinary technician students partnered with the Madison Cat Project (MCP) to spay and neuter community cats from the Madison area. The clinic was held at Madison College where students helped sterilize approximately 60 cats. Dr. Susan Krebsbach, long time HSVMA student mentor at Wisconsin, has been volunteering her time to this cause since she founded Dane County Friends of Ferals (now called Madison Cat Project). “Even though I have been involved with these events for more years than I want to admit, I am continually inspired by the dedication—and enthusiasm—of all of the students involved. Their fervor and spirit never gets old!” exclaimed Dr. Krebsbach. Dr. Karen Hershberger-Braker, instructor in the University of Wisconsin Department of Comparative Biosciences and co-advisor to the HSVMA student chapter, and Dr. Adam Bauknecht, Medical Director of MCP, led the surgeries with Dr. Krebsbach while students learned valuable surgical and anesthesia skills. 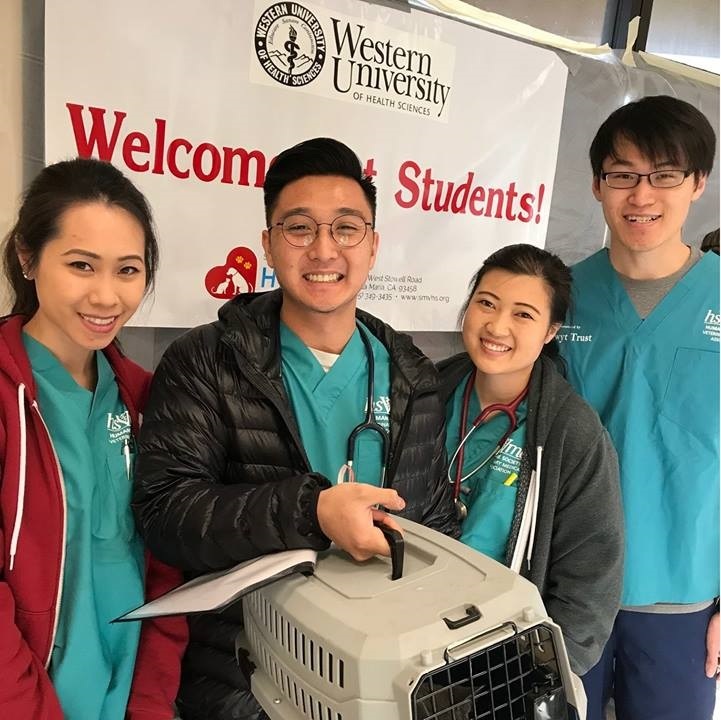 A group of veterinary students from Western University in Pomona, California, traveled to the Santa Maria Valley Humane Society for a day of cat spays and neuters. Approximately 100 cats were sterilized with the help of staff, volunteers, and vet students, of course! Dr. Zarah Hedge, Assistant Professor of Shelter Medicine at Western CVM and Hospital Director of Western University Spay/Neuter Center-East Valley, facilitated the Western students’ participation and the HSVMA student chapter got to experience first-hand how a high-quality, high-volume spay/neuter clinic operates. Veterinary students at Tuskegee University hosted their third annual spay/neuter day at the school this spring. Approximately 40 students, with the help of faculty and staff, provided a free clinic for pets in their community. Anthony Sena, a student in the class of 2020, said, “I’d like to thank the sponsors for the opportunity to participate in Spay Day! It was very beneficial not only as a review of previous years but also a teamwork exercise. Thank you so much for the experience and I can’t wait for it again next year!” World Spay Day clinics not only teach students technical and surgical skills, it also prepares them for real-life situations when working together as a team is as important as the quality of care. In addition, these clinics provide terrific preparation for future clinical work. Students see patients with uncommon problems and learn to adjust their plan according to their physical exam findings. 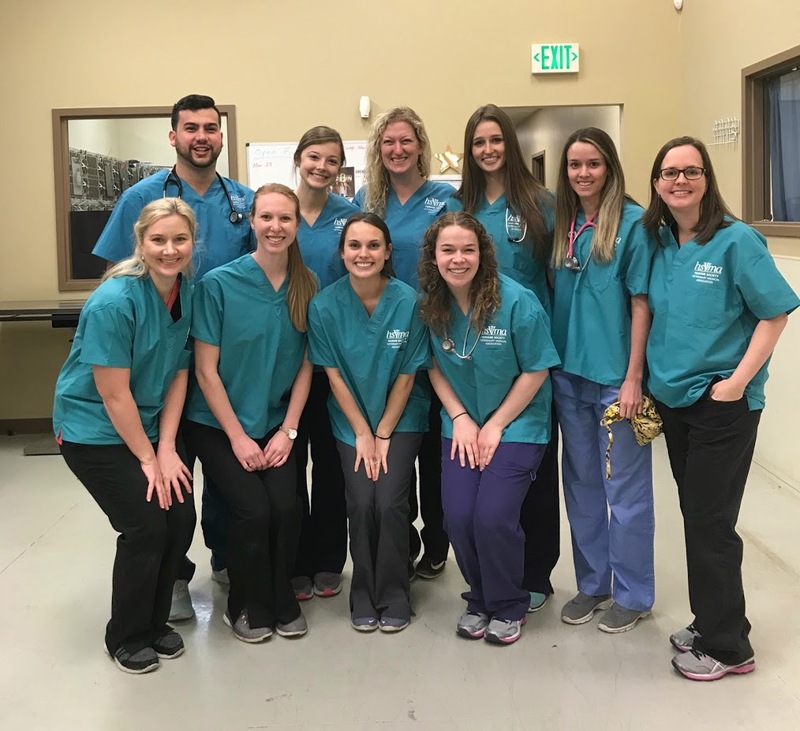 “As a first year veterinary student, the TUCVM Spay Day helped strengthen my knowledge of canine anatomy and provided a valuable clinical experience. I was able to identify structures that I learned in my anatomy course, and I observed a second degree heart block that we recently learned in physiology. The event was a great experience overall,” stated Sheree Deadrick, a class of 2021 Tuskegee student. 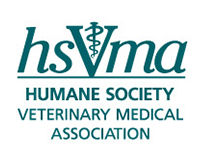 Once again, HSVMA is proud to sponsor World Spay Day clinics across the country. We recognize these events as a vital tool to teach upcoming veterinarians the skills needed to become proficient and compassionate veterinarians.